The market is void of healthy, high quality products that combine the best natural ingredients without compromising on flavor. 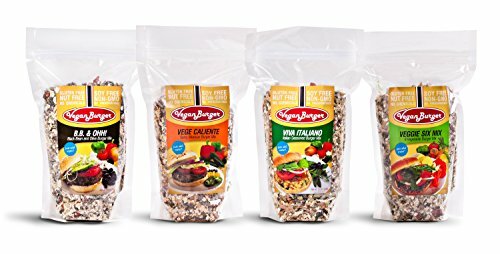 Our vegan burger mixes are a prime choice for anyone on the lookout for high quality, easy to prepare, palate-expanding, nutritious vegan food! And when you buy in bulk, you save time and money. A handpicked blend of garden favorites like peppers, beans, and olives is masterfully incorporated into each of our four mixes. Each retains its flavor from plant to bag, ensuring that you get the most out of each ingredient's distinct taste profile. Our mixes stand out from the competition as the only burgers that can provide you with a satisfying flavor without the addition of any harmful chemicals or food allergens. Plus, no more next-day burger regret. Just imagine: flawless vegan cookouts, parties, and BBQs parties with your friends and family. You now have the power to to thrill their tastebuds and keep them healthy at the same time. OUR BEST VALUE: Having guests? Dinner? Barbecue? Be the hero of the event with this 4-pack of our best-selling flavors. If you're looking for a vegan solution to please the crowd, this pack of 4 is the ideal solution. You get it all: 9 servings of Vege Caliente, the mix with satisfying kick. 9 servings of Veggie Six, our essential star-player. 9 servings of BB&OHH! !, our soulful mix of black beans and olives. And 9 servings of Viva Italiano, which takes your tastebuds straight to Rome. PUREST MIX ON THE MARKET: You can now provide nutritious meals for your family while adhering to the principles of a vegan or paleo diet. Our mixes are FREE of Gluten, Soy, Nuts, Chemicals, Preservatives or Additives, ensuring each scoop is as natural as it gets! Ideal for those with gluten or other food allergen sensitivities, they'll surely become your new, go-to comfort food! VEGGIE BURST! : Delicious straight-from-the-garden ingredients like pinto beans, rice, tomatoes and corn create the exceptional base for a hearty burger patty! Smoothly textured, robust in flavor and chock full of plant fiber, our vegan burger is the epitome of vegan cooking. It's the satisfaction of great burger, but without the regret the next day. What do you have to lose? 10 MINUTES TO BURGER! : It's quick, easy to prepare, and has minimal kitchen messes. There's nothing more anyone could ask for! Once you open the bag to one of our mixes, you're only a few minutes away from partaking in an extraordinary, palate-expanding gustatory experience. Add water, stir, fry, season your burger with any vegetable or dressing and enjoy! And since you're buying in bulk, you're getting an extraordinary deal. AUTHENTIC FLAVORS: With this bulk pack, you're getting not one but four of our tried-and-true flavors, each with its own personality. So whether you're hosting a BBQ, intimate dinner, or party there's something for everyone. And especially if you're a vegan food aficionado, you owe it to yourself to try our highly-acclaimed mixes. It's time to invest in your palate and your health, so stock up while supplies last! If you have any questions about this product by Veganburger, contact us by completing and submitting the form below. If you are looking for a specif part number, please include it with your message.